Is bankruptcy the only option to stop an Alabama foreclosure? 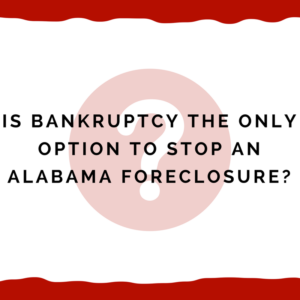 No — there are many other options to stop a foreclosure in Alabama without having to file for bankruptcy. I understand that when you are facing the loss of your home, it feels the world is closing in on you. And your friends and family (meaning well) will tell you that your only hope is bankruptcy. Or just let the foreclosure happen and move out. Sue your mortgage company before the foreclosure to have your defenses evaluated by the court. Obtain a loan modification or other loss mitigation solution before the foreclosure. Use RESPA letters to convince your mortgage company to stop the foreclosure. Sue your mortgage company for violating the law. Before we get to these four options that are almost always much better than bankruptcy, let’s talk about bankruptcy for a moment . . . . Yes Bankruptcy will likely stop a foreclosure but is such a life changing event worth it when you have five (5) better options? Bankruptcy normally (but not always) will stop a foreclosure if filed before the foreclosure. Temporarily stops it I should say. There is what is known as the “automatic stay” that tells the mortgage company to freeze or stay or pause the case. But this is a short term fix — if you can’t pay the original payment PLUS the back payments, you’ll end up with a foreclosure or with you walking away from your home. And then have a foreclosure on your record. Bankruptcy stays on your credit report for about 10 years from when filed. You always have to answer “Yes” when asked in a credit application (or other application) if you have ever filed for bankruptcy. Sometimes it is needed but you can almost always use one of the options below to stop a foreclosure. So instead of being forever marked as someone who filed bankruptcy, at least explore these other options. You will likely find they will help you stop the foreclosure without the damage of a bankruptcy. Almost all foreclosures in Alabama are “non judicial” which means no judge ever looks at them. How crazy is this? Some crooked mortgage company is going to take your home all without a judge ever even seeing it. Recognizing the absurdity of this, almost every mortgage document says that you have a right to have any defenses to a foreclosure (and acceleration/default) heard in court. Well, since the foreclosure is not going to be filed in court (unlike a Florida foreclosure), the only way to have your defenses heard in court is for you to sue your mortgage company. This does not mean you are suing for money damages (although often you will) but instead the focus is on whether the mortgage company has a right to foreclose on you. In essence, this turns a non judicial foreclosure into a judicial foreclosure. In our experience, the mortgage companies stop the foreclosure as they understand the enormous risk they would run to go ahead with a foreclosure when you are asserting your rights under the mortgage. If they foreclose (which I have not seen them even try to do), then the consequences could be very severe for the mortgage company. So they cancel the foreclosure sale or reschedule it. Now you will get a litigation lawyer in the case who we can talk to about how to avoid the foreclosure. You still need to make sure it makes sense to stay in your home and that you can reasonably afford your payments. If you can, then normally the mortgage company will work this out where you can get some type of loss mitigation (such as a loan modification). This will allow you to stay in your home. Best option when: You cannot get your mortgage company to agree to stop the foreclosure or you are 7 days or less away from the foreclosure date. But if you are more than 7 days out, this option works great as well. Do it yourself or hire an attorney: To do this right you need to hire an attorney that understands foreclosures as well as how federal and state law work together to help you. When we see folks do this on their own, it normally does not end well. If you do this, normally the foreclosure will stop. There are all sorts of exceptions, etc. but this is a good starting point. The foreclosure will be halted while your loss mitigation request is being considered. You still run the risk of the request being denied but as long as you make a 100% diligent effort to get the best possible package in as quickly as possible, then you will increase your chances of permanent success. Best option when: You are about 6 weeks (42 days) out from your foreclosure. If under 38 days, then it becomes harder (but not impossible) to stop a foreclosure but usually you’ll need to combine with another option if you are that close the sale date. Do it yourself or hire an attorney: You can do this on your own but you must be very diligent about handling it correctly. See our free training video series with workbook on Alabama foreclosures. Having an attorney costs money but you may decide it is worth the price to help save your home. Reinstate your loan and avoid foreclosure. This is where you pay off the back amount that is owed. Maybe your payments are $2,000 a month and you are 5 months behind. You ask the mortgage company for a reinstatement amount and they tell you it is $12,000. That’s 5 months plus some fees, etc. You pay that money and the foreclosure must stop. We do currently have a case where our client did this and the mortgage company still foreclosed. That’s a huge problem for the mortgage company and we have sued over this. Pretty unusual they do something that stupid after you pay them the reinstatement. But just goes to show you that you have to be very careful and make sure you are on top of everything. Even when you pay, you have to protect yourself from the mortgage company. Best option when: You have the money to reinstate. Usually this can be done pretty close to the foreclosure date but you need to verify what your mortgage contract says. And see what the foreclosure lawyers tell you. Do it yourself or hire an attorney: Normally you can do this on your own. You need to make sure you are doing it right as the mortgage company will be thrilled if you make any mistakes. It will view those as permission to reject your reinstatement and then take your home. We have written extensively about RESPA letters such as “Notice of Error” and “Request for Information” letters. We also have a free training video and download for using RESPA letters. We’ll keep this section short as you can look at the links above. The basic gist is to point out to your mortgage company all the mistakes/errors they have made. This gives them a chance to fix those errors. And any questions you about the servicing of your loan — they can answer those. Often if done right, and if done in the right time frame, this can be very helpful in showing the mortgage company that it needs to stop the foreclosure and deal with you on these issues. Best option when: You are at least 30 days out from the foreclosure. Do it yourself or hire an attorney: Our materials linked above will show you the concept of how to do this and give you some examples. To be blunt, we find many folks that say they are doing this on their own will take short cuts. Decide to send the letters to a different address than required by law. Not be willing to follow up. So you can do it but it will take a lot of work. Some prefer to hire us so they know they are doing it correctly. This is where your mortgage company has definitely violated the law. There are no guarantees but mortgage companies aren’t normally 100% foolish when sued. They look to see if they have been caught and then what is the downside. Normally this makes them interested in resolving the case and getting you back making payments to them. Best option when: Most anytime but given the nature of these cases it tends to be under 14 days from the scheduled foreclosure. Do it yourself or hire an attorney: To be blunt — you will be very foolish doing this on your own. This is your one chance to stop the foreclosure and get the relief you deserve. Don’t blow this by doing it on your own. We see this time and time again. People come to us after this has been botched and normally it is too late (and way more expensive) to fix the problem than to do it right the first time. Facing a foreclosure is a terrible experience. All sorts of emotions come out — fear, guilt, anger, etc. And many times well meaning people tell us there is no hope except to ruin our financial lives by filing bankruptcy. Understand that almost certainly you have other options, especially if you take immediate action. One option — often the best option if time is short — is to sue your mortgage company before the foreclosure to have your defenses evaluated by the court. Or if there is time, try to get a loan modification or other loss mitigation solution before the foreclosure. Perhaps you can reinstate your loan if you have the money to do so. Especially if you have some time, you can use RESPA letters to convince your mortgage company to stop the foreclosure. And you can always sue your mortgage company for violating the law as they so often do in this type of situation. Call us at 205-879-2447 and ask for Randi or fill out our contact form. Let us know the date of the foreclosure, your mortgage company, and anything else you think we should know to help you.